When the global communications, hosting, cloud, and IT services company CenturyLink set out to create its new collaborative R&D facility, aptly named the CenturyLink Technology Center of Excellence, they had one thing in mind: to “wow” everyone who enters the building. And wow it does, with a lobby featuring LED column wrap displays, an executive briefing center (EBC) with a wall of touchscreens, an outdoor workspace, and interactive conference rooms, this center provides employees with a space that can truly inspire. 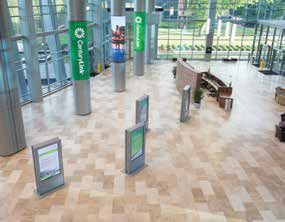 The lobby of the CenturyLink Technology Center features LED column wrap displays from NanoLumens.CenturyLink’s executive briefing center includes 12 Planar touch display monitors to create an interactive space during meetings. The 300,000-square-foot, state-of-the-art R&D facility was under construction when Addison, TX-based design consultants Idibri were brought in to help with the AV portion of the project, led by Ben Cating, senior consultant, VP. “We helped brainstorm about best practices for standard conference spaces, as well as some big ideas that impact the entire space,” Cating explained. In the lobby space, 37,000 square feet of View Dynamic Glass provides nanotechnology and pre-programmed intelligence to tint automatically in response to outside conditions and user preferences, eliminating the need for blinds or shades. However, even with the self-adjusting technology, the lobby is very bright, which is why Cating chose NanoLumens’ technology for the LED column wrap displays. Three columns are wrapped with NanoLumens’ 5MM NanoWrap displays in a 42-inch-diameter circular panel that covers 12 feet of vertical surface on each column. The NanoLumens LED panels, made up of thousands of Nixels, NanoLumens’ patented display module, turn these architectural elements into archi-technological elements. They provide a continuous stream of full-motion video that’s visible throughout the entire lobby and from any angle. Each display can show different video content, or all three columns can play synchronously, with content fed over IPTV via fiber from a cloud-based Cisco-AppSpace content delivery system. Addison, TX-based Idibri was the consultant for the new 300,000-square-foot CenturyLink Technology Center of Excellence in Monroe, LA. The NanoWraps are attached to the columns by a unique circular mounting system, incorporating a custom metal frame around the column in which the panels are attached. AV systems integrator American AVL, based in Ruston, LA, was the integrator for the project. CenturyLink also wanted a high tech space to conduct board meetings, so Idibri chose to install a large touch display wall made up of 12 Planar monitors (two by six). “They wanted a collaborative space where they could meet and have multiple people editing and writing,” Cating said. One of the biggest challenges for this project was working with the complex network that was installed with the technology. “The larger monitor walls run off the network—SVSi’s distribution model over IP has all the traffic running on their facility matrixes,” Cating explained. Within the technology center is an outdoor courtyard that Idibri also helped set up. “We wanted to facilitate the client’s goal to make it a place where people would be able to work outdoors. There’s a pecan grove and it’s peaceful. We added background music to add to the ambience,” Cating said. The courtyard includes an installation of Klipsch monitors and JBL ceiling loudspeakers. Since the installation, Cating said he continues to work with CenturyLink to finish small technology adjustments and other smaller issues they may have.